"FeLV does not pose a risk to other species of animals or people." Feline leukemia virus (FeLV) is one of the most important infectious viruses of cats. It was first discovered in cats with a form of leukemia, hence its name. FeLV is the cause of a variety of diseases, not just leukemia. Like all viruses, FeLV is a tiny microorganism consisting of nucleic acid and a few proteins and glycoproteins in a simple structure. Viruses can only replicate themselves inside living cells. FeLV is specific to members of the cat family and does not pose a risk to other species of animals or people. FeLV infection is found worldwide. In general, around 1-2% of the cat population is persistently infected with this virus, and many more are exposed. The proportion of cats infected differs according to the geographical location, environment and the life-style of the cat. 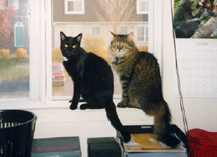 Infection is more common in colonies of cats where there is close contact between individuals. What disease does the virus cause? FeLV invades and replicates in various cells, including cells in the cat's immune system and blood-forming tissues. To replicate, the nucleic acid (genetic code) of FeLV inserts itself into the nucleic acid of the cells it has invaded. The result can be death of the cell or a mutation or change in its genetic code. Such a change can make the cell potentially cancerous; the cancerous change may not occur for months or years after infection. Cancers can occur in a variety of tissues, organs and body sites, depending on the type and location of cells that have been infected with FeLV. Such cancers can involve any type of the circulating white blood cells (leukemia) or other cells of the blood-forming tissues. The most common tumor associated with FeLV is that of lymphoid cells known as lymphoma orlymphosarcoma. These tumors may occur at single or multiple sites in the body. Although the development of cancer is one outcome of FeLV infection, other diseases more commonly develop. In many cats, FeLV infection results in a moderate to severe suppression of the immune system. This means that the infected cat is less able to defend itself against a wide range of infections that would not normally cause a problem in healthy cats. Affected cats may develop various clinical signs, and there is a progressive deterioration in their health over time. Another common occurrence in FeLV-infected cats is the development of a profound and life-threatening anemia. Other problems, including abortion, severe enteritis (intestinal inflammation), neurological (nervous) disease, and ocular (eye) disease are commonly associated with FeLV infection. FeLV is usually fatal. Studies have shown that 80-90% of FeLV-infected cats will die within three to four years of initial diagnosis. "Direct contact between cats is the most frequent method of FeLV infection." Direct contact between cats is the most frequent method of FeLV infection. The virus is fragile and cannot survive longer than a few hours outside of the cat. A cat with FeLV sheds a large quantity of the virus in its saliva as well as in other bodily fluids such as nasal secretions, urine and feces. However, FeLV is not a highly contagious virus, and transmission generally requires a prolonged period of close contact between infected and susceptible cats. Close contact activities include mating, mutual grooming, and sharing of litter trays and food bowls. Cat bites by an infected cat can readily transmit infection. Another potential source of infection occurs when a pregnant cat infected with FeLV gives birth. In this situation, the kittens may be born with FeLV virus or, more likely, are infected when their mother grooms them. Fortunately, most queens infected with FeLV are infertile or there is pre-natal death of the kittens with abortion or resorption of the fetuses. What happens when a cat is exposed to FeLV? Not all cats exposed to FeLV will develop persistent infections. Many of the cats that are infected are able to mount an immune response to the virus. This immunity is successful in eliminating the virus in approximately 30% of the adult cats exposed to FeLV. However, there will have been a period of some weeks before they cleared the infection, during which the virus was replicating in those cats. During the period when FeLV was replicating inside those cats' cells, there may have been cell changes that could lead to disease later in life. Approximately 70% of cats are unable to mount an effective immune response and eliminate the virus. Following infection, these cats become persistently and permanently infected with the virus and are at the highest risk of developing FeLV-related disease. It is these permanently infected cats that are primarily responsible for the transmission of FeLV to other cats. It can be many months or even years between the initial virus infection and the onset of related clinical disease problems. During this time, virus particles may be continuously shed in the cat's saliva. How can FeLV infection be diagnosed? Diagnosis of FeLV infection is relatively simple. A rapid blood test can be performed which is able to detect viral proteins of FeLV in the blood of an infected cat. This test is very accurate and reliable, although false results may rarely occur. Some cats with only a transient FeLV infection (those cats that are able to mount an effective immune response) will be positive on the blood test. A second test performed eight to twelve weeks after the first test may be required to confirm persistent infection. In some situations, it may be necessary to confirm infection through further blood testing at a specialized laboratory where more sophisticated tests are available. 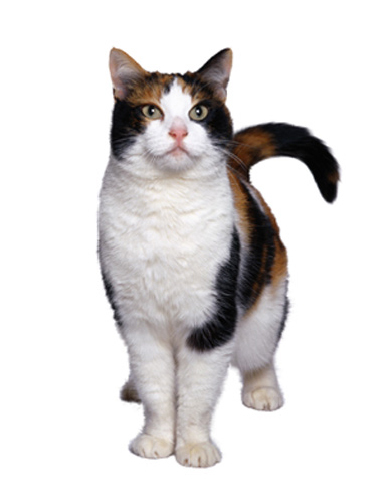 "Diagnosis of FeLV infection is relatively simple." Diagnosis of disease due to FeLV is more difficult because of the variety of signs and symptoms. It is common to have a complicated situation in which other diseases or conditions co-exist with, and are promoted by, the FeLV infection. Is there any treatment for FeLV infection or disease? "There is no treatment to eliminate the virus from the body." There is currently no specific treatment for FeLV-infected cats. There is no treatment to eliminate the virus from the body. Most FeLV-infected cats will eventually die or be euthanized because of diseases related to their infection. However, many cats showing FeLV-related disease will improve with symptomatic treatment, at least for a time. For example, if FeLV is causing immunosuppression and the patient develops secondary infections, the secondary infections may be treatable, leading to clinical improvement. Vaccines are available to protect cats against FeLV infection. Their use is highly recommended for any cat that goes outside at any time and therefore could have contact with FeLV-infected cats. As with other vaccines, an initial course of two injections is required, and regular boosters are necessary to maintain immunity. Your veterinarian will discuss the most appropriate vaccination options for your cat with you. All cats should be tested for FeLV prior to vaccination. Although vaccination is very helpful in preventing infection with FeLV and thus controlling FeLV-related disease, no vaccine is 100% protective. Do not allow your cat to roam. Where possible do not allow your cat, particularly if a kitten, to come into close contact with known FeLV-infected cats or cats without a known history of proper vaccinations. "Vaccinating a cat does not interfere with subsequent blood testing for FeLV." In larger colonies of cats, it is possible to control FeLV infection through a combination of routine FeLV testing, quarantine and vaccination programs. Fortunately, vaccinating a cat does not interfere with subsequent blood testing for FeLV.